I used to bake lots before I had Ru, but since having him I just never really found the time. 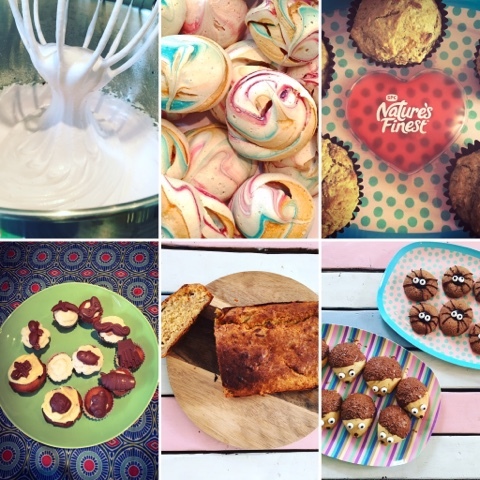 Since the twins started school my time freed up a little so I've been able to get back into the kitchen and bake up some tasty treats. 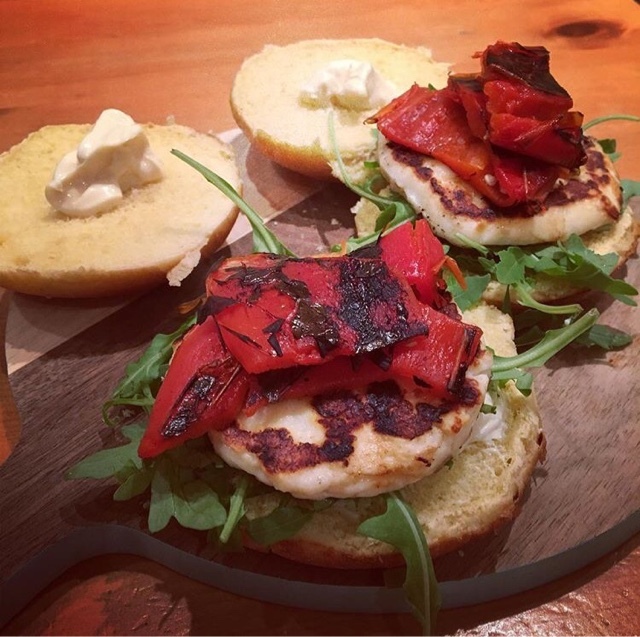 Back in June when I went to Britmums live I had an amazing veggie burger - (Halloumi, roasted pepper on a bed of rocket) in a burger joint up in Camden and pretty much every week this month I have been craving it, so I have been making it myself and forcing Jon to enjoy it! 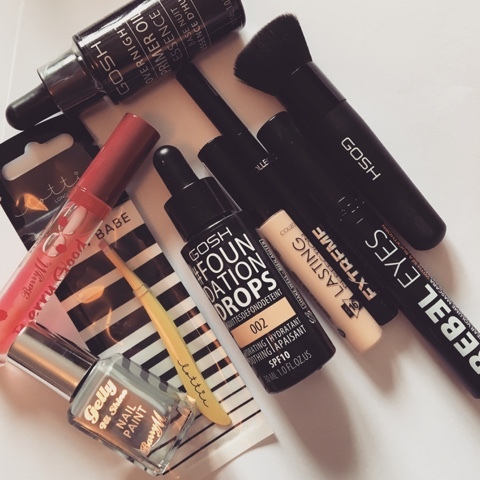 I treated myself to some new make up a few weeks ago from Superdrug and decided I wanted to try a different brand of foundation, so I opted for GOSH, a brand I'd never used before but had heard great things about. I LOVE LOVE LOVE the foundation drops and evening primer. My skin hasn't felt this good in ages! I'm now also taking Vitamin E and Omega 3 tablets. I was sent some Sensitive red skin facial cream and oh my gosh its amazing. I get rosy cheeks and often get break outs when trying new products and this cream really did combat my redness and didn't cause me to have any breakouts. My skin is also left super smooth after uses. I use it every morning before applying my make-up. 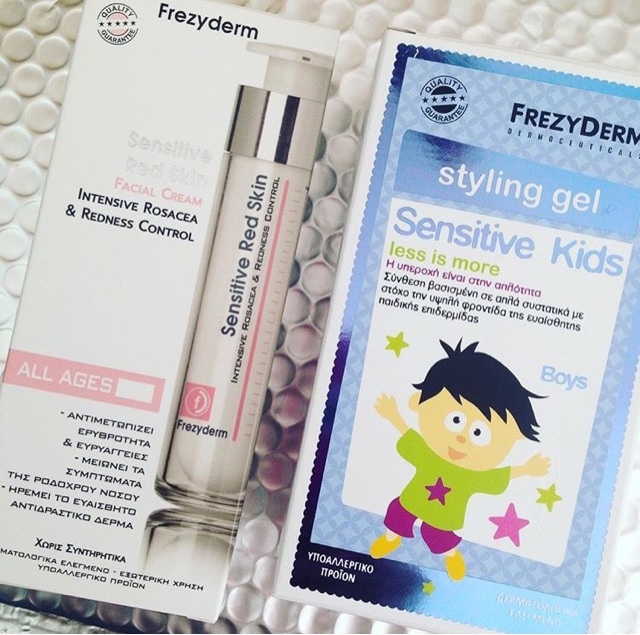 The boys have also been using Frezyderm's sensitive kids styling gel to keep their hair looking super cool whilst their at school! 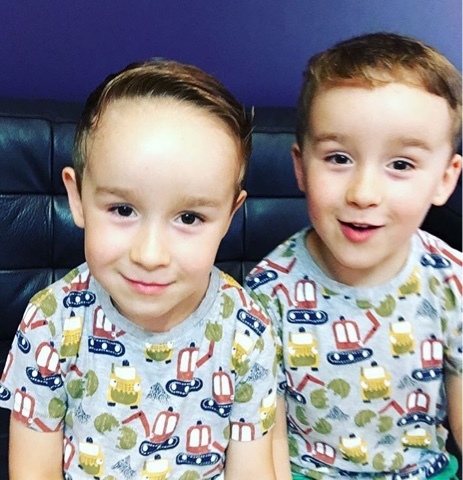 Since having their hair cuts I had been on the look out for a product that would keep their hair smart but without causing any damaged. This styling gel does just that! The boys are terrible when it comes to brushing their teeth, if I don't stand and watch they wont do it. He's even faked brushing his teeth by smearing toothpaste in the sink.....he's good to put effort into that but not just brushing his teeth - logic I just don't understand. So when I was contacted by the guys at Playbrush I knew I wanted to try it. Anything that's app based is a winner with the boys so I had high hopes this would be the magic thing that got them to actually brush their teeth. Playbrush is an award-winning device that helps children with their daily tooth brushing by making it a fun game. 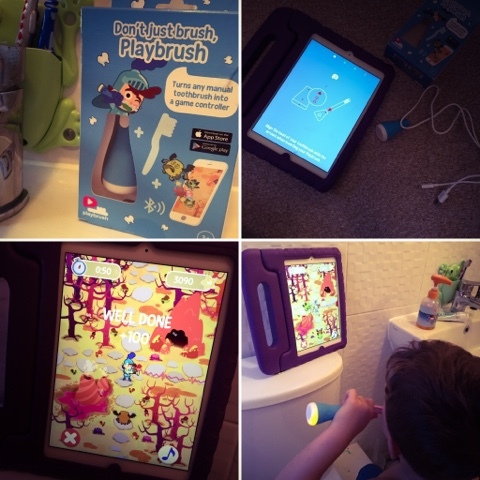 With Playbrush, kids can play entertaining & instructional mobile games whilst brushing their teeth. 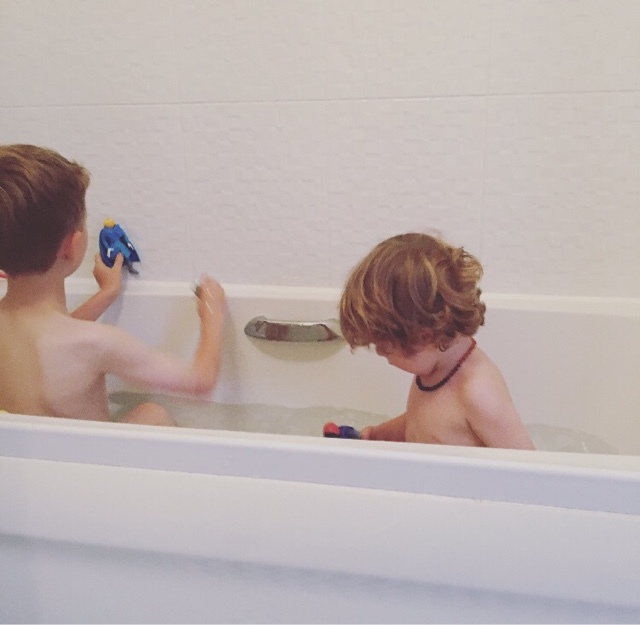 The boys are now more than keen to get into the bathroom and brush their teeth. They even have tooth brushing competitions to see who can score the most points! The playbrush really is genesis idea! I had never heard of Mustela before I was contacted by them so when they asked if I wanted to try some out I was more than happy to say yes. Cleansing gel 2 in 1 body and hair for baby and child, ideal for travel from birth on. Protects the vital resources in baby's skin today and for tomorrow. I have loved using the products on Ru and the boys. 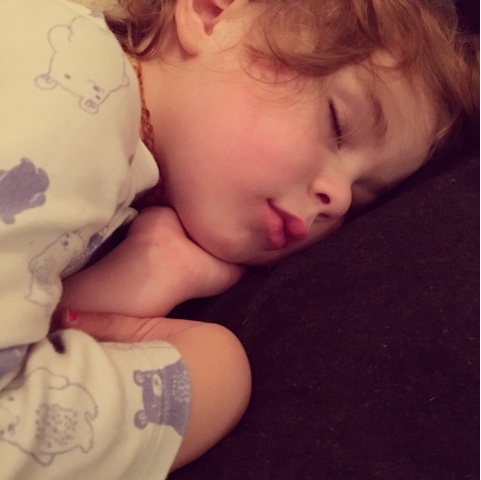 The comfort balm has become part of our bedtime routine! Now the weather has turned and the mornings are rather chilly, I have enjoyed waking up and putting on my onesie and sitting down to enjoy a nice hot coffee before the madness of the day starts! *These products have been sent to me free of charge but all thoughts are my own! With Christmas just around the corner....yes I know I said the C word. I thought I'd share with you this very cute musical Thomas the Tank. 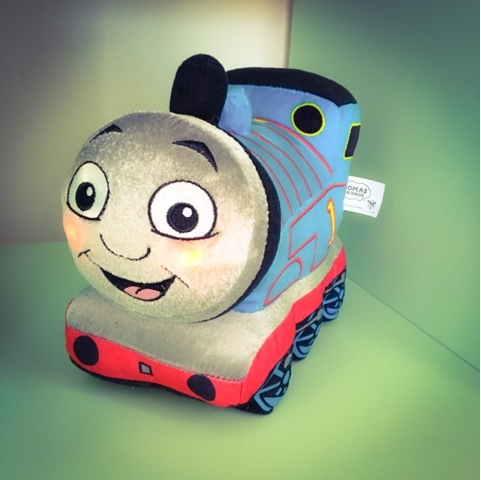 'The iconic Thomas theme tune plays when you give Thomas' blue dome a squeeze. As the music plays his cheeks softly glow in different colours, adding some magic into everyone's favourite engine. Thomas' iconic sounds also play with a squeeze of his black funnel. 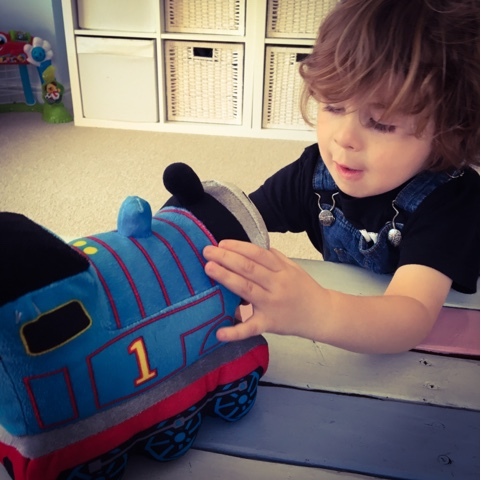 Rupert loves his Light up Thomas and has been having great fun sliding him up and down the coffee table and taking him on daily adventures. Thomas is super soft and he often finds his way to Ru's bed come bedtime. 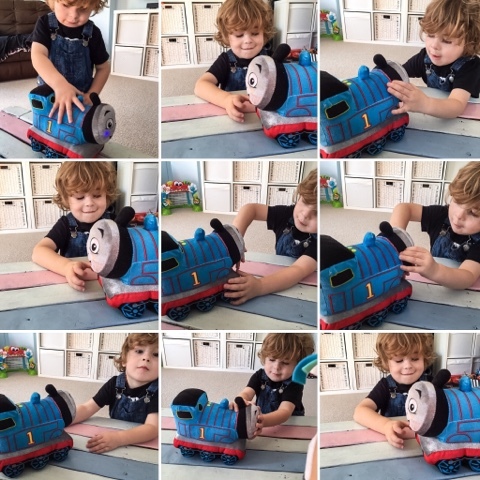 No matter how many time Ru plays the Thomas theme tune his face always lights up with Joy when he presses the button. Thomas's smiley face even makes me smile! This would make an excellent gift this Christmas. Why not enter the Rafflecopter below. The prize will be sent from Golden Bear Toys PR. I will email the winner and they will have 24 hours to respond before another winner is picked. This little child of mine has no fear what so ever! The other boys aren't even that keen on going down the slide let alone climbing up it, but ...... Little Ru he doesn't care! He would probably climb the highest mountain if he wanted too! A heavy picture post I'm afraid. We went last year and got so carried away that we ended up spending well over £20 on all sorts of different pumpkins. We did eat a fair few and had pumpkin carving competitions but still had lots left over that went to waste. 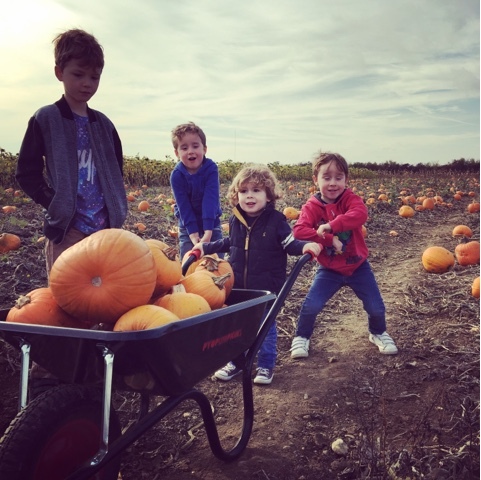 So this year we said the boys that they could only pick one pumpkin each. Well that was the plan, I left Jon to it as Alex needed the wee which was right back by the car so by the time we returned Jon and the boys had filled up the wheel barrow. 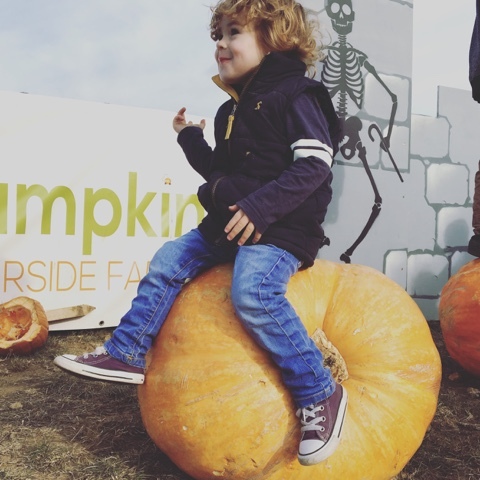 Rupert has developed a strange love for pumpkins since he spotted one back in Morrison's at the start of the month, so he was in his element seeing all the pumpkins. 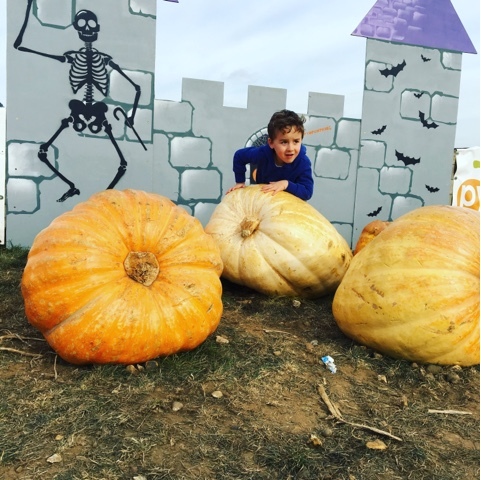 He is probably the main reason we have more than 4 pumpkins! 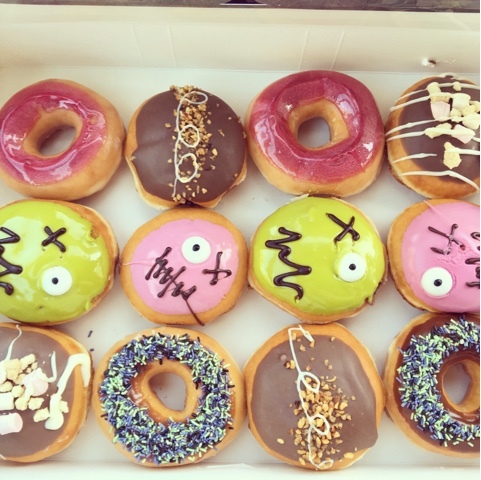 After finishing at the pumpkin patch we decided the best way to end the fun was to take a pit stop into Krispy Kreme's and get some spooky doughnuts! Now to decide what we are going to do with all these pumpkins! 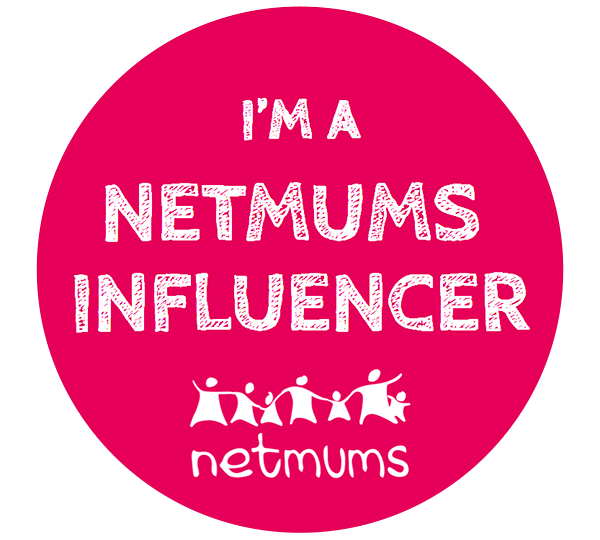 Unique social enterprise brings together network of registered nutrition professionals offering localised, tailored support within early years settings. The Early Years Nutrition Partnership (EYN Partnership) has brought together a unique network of self employed, registered nutritionists and dietitians, each with extensive experience in the early years. They will work alongside and within early years settings, to help them achieve accreditation with a new EYN Partnership Quality Mark. 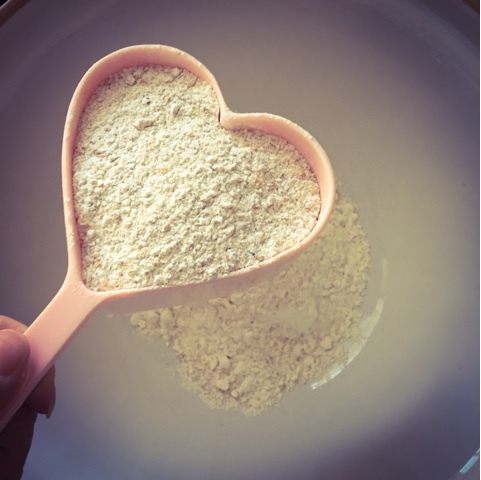 The support provided by the nutrition professionals will be tailored to meet the individual needs of each particular setting and community in which it operates. Early years settings that sign-up to the EYN Partnership will also be able to upskill their team with opportunities for professional development. 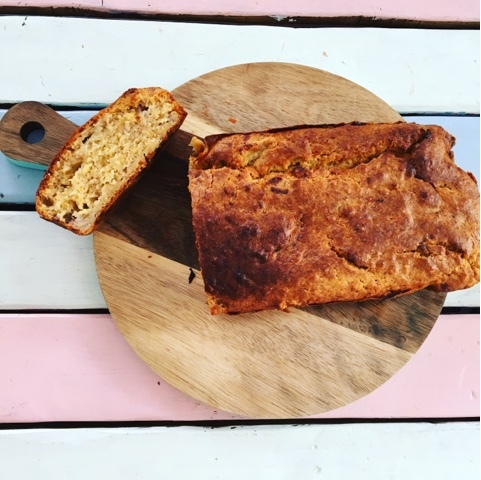 The EYN Partnership will provide study places for a Level 3 CACHE award in nutrition and hydration in the early years, and early years setting chefs and cooks will be able to study for a Level 2 CACHE award in the preparation of meals to meet relevant nutritional standards in an early years setting. 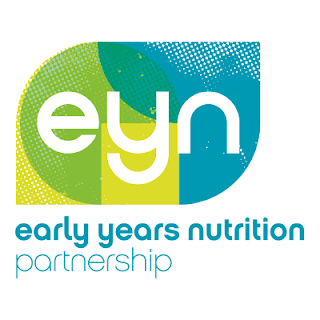 If early years settings choose to do so, they can also access additional services from their EYN Partnership nutrition professional, such as the delivery of bespoke classes for parents, children or practitioners. 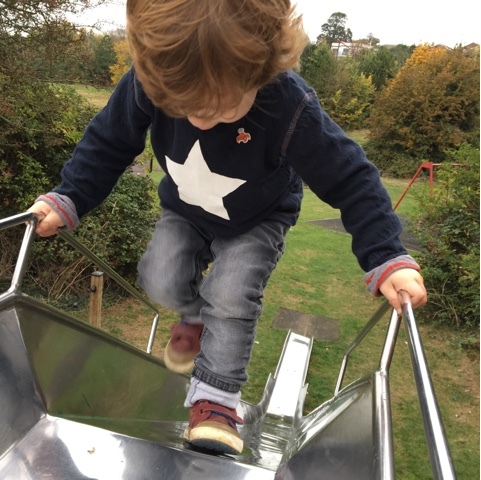 Integral to the EYN Partnership model is a commitment to support settings with the highest social deprivation needs, with an ambition that in the first year of the programme at least 10% of the settings registered with the EYN Partnership will benefit from subsidised access. A measurement framework and evaluation strategy has been developed to analyse the success of the programme in delivering demonstrable and sustainable social change. 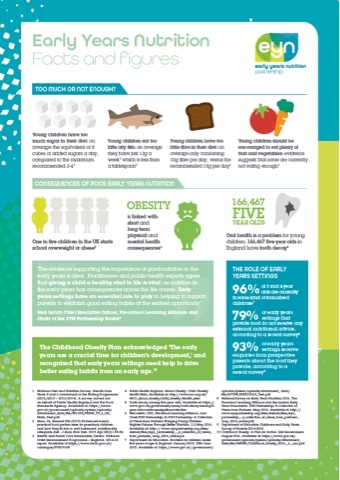 Neil Leitch, Chief Executive Officer of the Pre-school Learning Alliance and Chair of the EYN Partnership Board, says: ‘Childhood obesity is one of the biggest public health challenges of our time, and we know that eating a healthy diet during the early years has a significant impact on health outcomes later in life. Early years settings have an essential role to play in helping to establish good eating habits and positive learning about healthy eating. According to the National Child Measurement Programme, one in every five children starting reception in England is either overweight or obese. 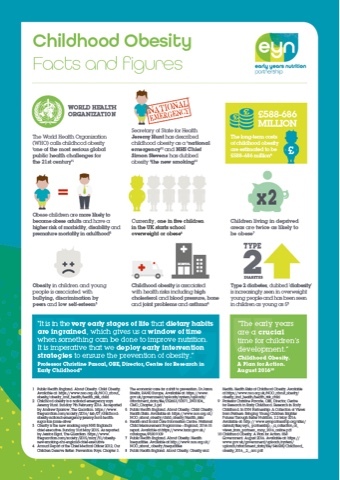 1 Obese children and young people are more likely to become obese adults, and have a higher risk of morbidity, disability and premature mortality in adulthood. 2 Amongst other issues associated with poor nutrition in childhood, twenty five per cent of five year olds are reported to experience some tooth decay. 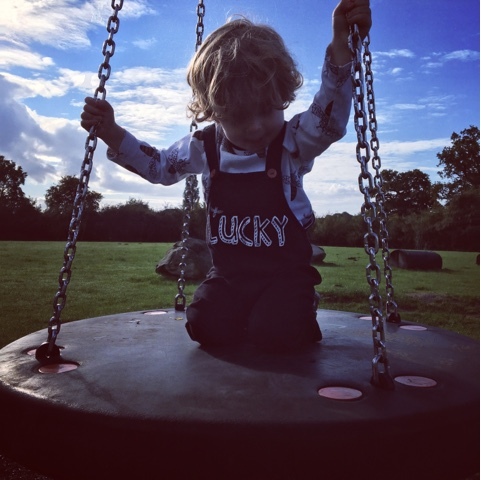 3 Catherine Lippe (RNutr), is one of the first EYN Partnership nutrition professionals and is working with settings in London, Surrey and neighbouring counties. She says: ‘Many early years settings are fully embracing the nutrition challenge and are determined to deliver good standards for the children in their care. They have of course previously had access to guidelines, but until now haven’t had an option to be supported in implementing the changes they need to make. 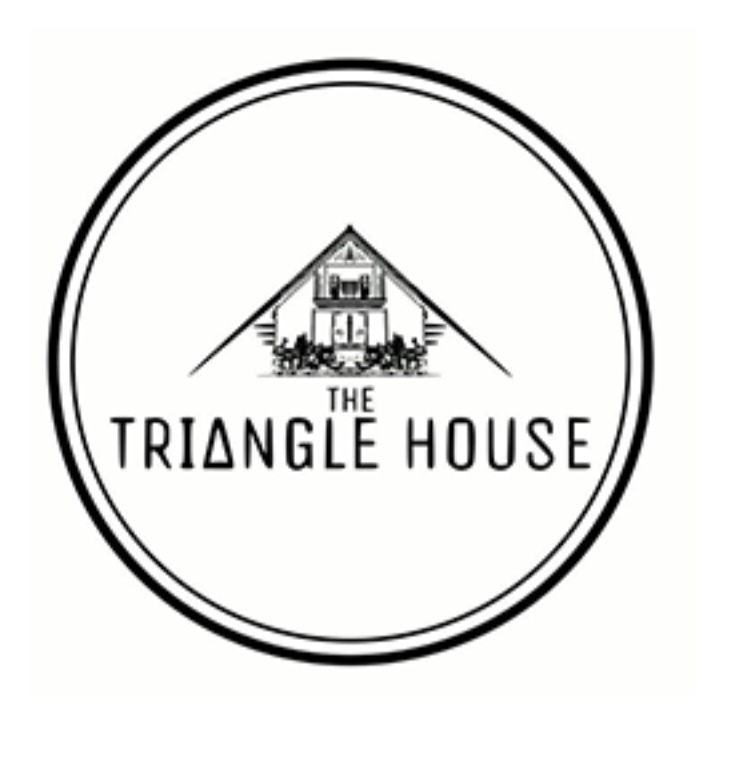 We can support them on a journey to make real changes in menus and food related activities, help them achieve recognition for what they are doing, and train practitioners helping them to develop their nutritional expertise. 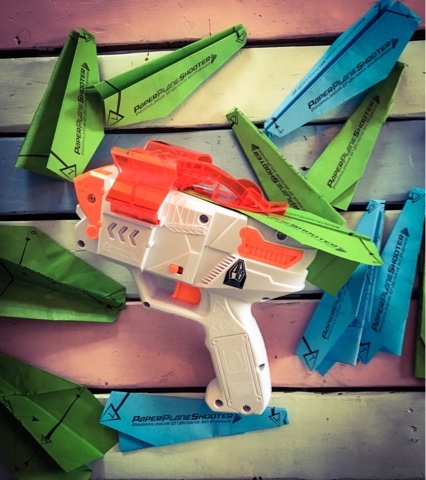 The boys love making paper planes and seeing how far they can fly them, so when I was asked if I wanted to review the Paper Plane Shooter from Vivid Imaginations I knew I would be silly to say no. As soon as the boys saw it they were desperate to have a go. They literally tore open the plans with their teeth! The shooter needs 4 AAA batteries which aren't included. 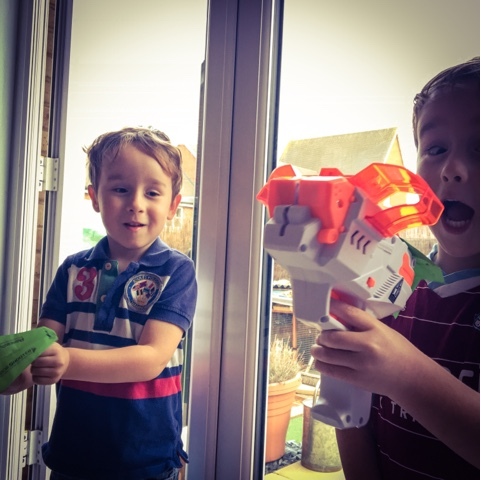 Once opened the boys all took a turn at shooting it out into the garden. Even Jon wanted to get involved. It was great fun watching them all scream with excitement when they saw how fast and far the planes all flew. On occasion the planes didn't always fly but once they all understood how the planes loaded they had no more issues. This would make an awesome gift and I can see me buying 2 extra ones as the boys are already wanting plane races! I was recently sent a pot of mango's and peaches from Nature's finest foods. I buy these occasionally as I know the boys love them. Usually I just pop them in a bowl and let them help themselves, but this time I wanted to try something a little different. 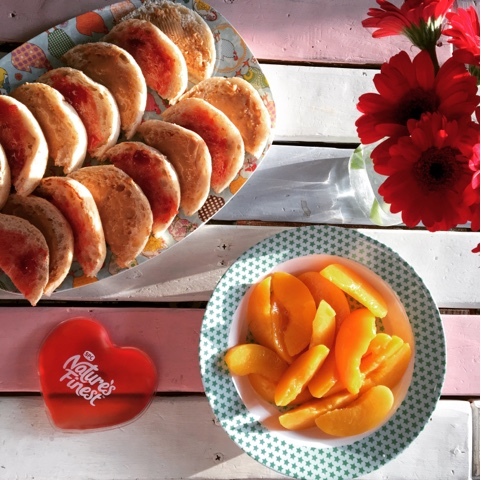 So the peaches got served as normal for breakfast but with the mango's I decided I wanted to be a bit more creative. 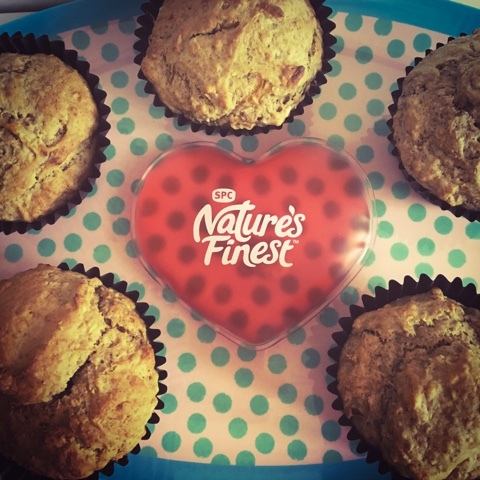 So I searched the net and found a coconut & mango muffin recipe! 1 tub of Mango sharing pot from Nature's Finest. In another bowl whisk together the mango, sugar, egg, milk and melted butter. Pour over the dry ingredients and mix. Spoon the mixture into the cases and place in the oven for 20 - 25 minutes or until firm to touch. Let them cool for 10 minutes and then Enjoy. The boys weren't big fans, but Jon and I thought they were great! **I was sent the sharing pots for the purpose of this post. I have a strange love for printing things off. The love affair never lasts long as when the ink runs out I become uninterested as ink is just far too expensive. Specially when you're needed to buy new cartridges every couple of months. 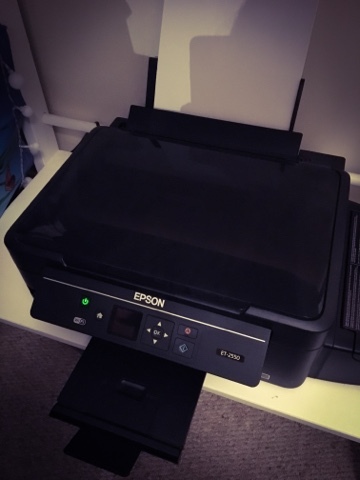 So when I heard that the Epson Eco Tank printers ink will last up to 2 YEARS I needed that printer in my life! With printing costs reduced by 74% on average and no fuss, no surprises, Epson's EcoTank printers are the perfect choice for any busy household after the ultimate economical printer. A 3-in-1 inkjet with print, copy and scan features, the ET-2550 couldn't be easier to maintain, with two years' worth of ink1 included in the box. Wi-Fi direct and a 3.7 cm colour LCD screen make it even easier to use. The initial outlay is more but in the long term it works out cheaper! 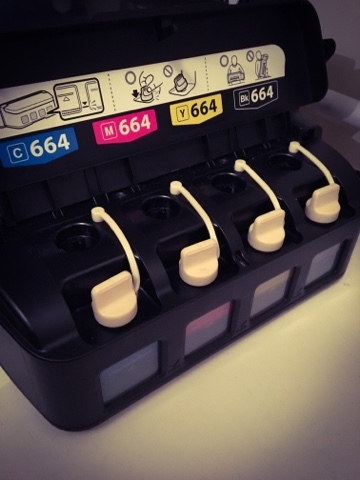 The included ink bottles can print up to 4,500 pages in black and 7,500 pages in colour at just a fraction of a penny per page. Which is absolutely perfect for a big household like mine. The boys love me printing off colouring in pages and Jon uses it for business. When I'm looking for rainy day ideas I always tend to go to the Disney Inspired website and click on the craft tab, which then leads me to an array of different activities that I can print out for the boys to make. 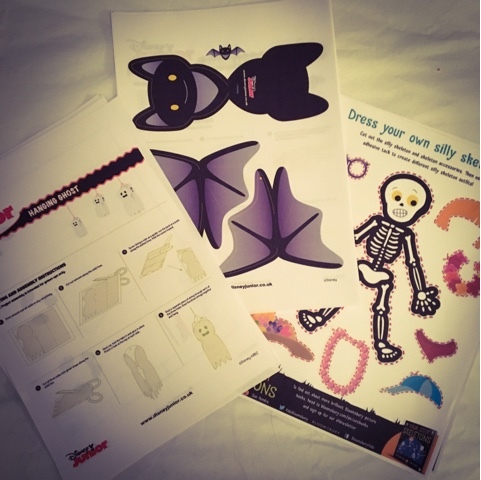 At the moment they have some perfect Halloween activities, that I've printed off ready for their second week of holidays! 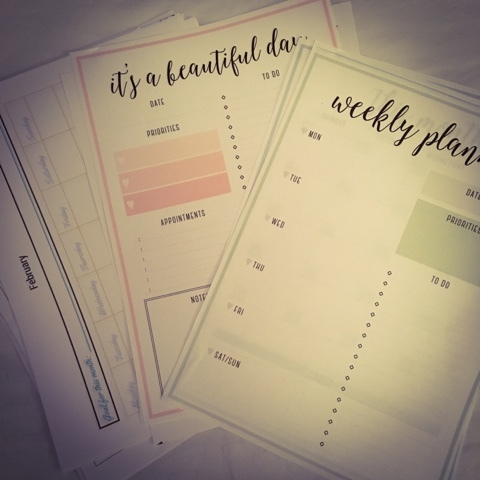 I also find a lot of cool printable's over on Activity Village. I no longer have to worry about what and when I print. In a strange way its rather liberating. You can buy the printer off amazon. **I was sent the Eco Tank printer for free, in return for an honest review. Yesterday we took a day trip up to Norfolk to view another house. The house we originally put an offer in on way back in July has been extremely hard to get going and the guy selling it hasn't even signed the contracts. He keeps avoiding the estate agents and we just seem to at a dead end. So we decided that we needed to get back on the house hunt. We went and viewed a gorgeous house just down the road from Kings Lynn. We all fell in love with it and wanted it there and then. We put an offer in and waited. Before the long drive back to Kent, we found a park local to the house and let the kids have a run around. It was wet and slippery so we told them not to go on anything too wet and try not to get too muddy. Well famous last words...... Rupert went on the roundabout and as he was getting off slipped, fell face first into the metal seat and smashed his gums up and cut his lip open. I eventually stopped the bleeding with my cardigan and both Jon and I decided it didn't need a trip to a&e but we'd put him in the front of the van with us so we could keep an eye on him. He's rather bruised but everything seems ok and he isn't mentioning it hurting. To be on the safe side I'm going to book him a dentist appointment tomorrow to get his teeth checked over and make sure nothing is wobbly. 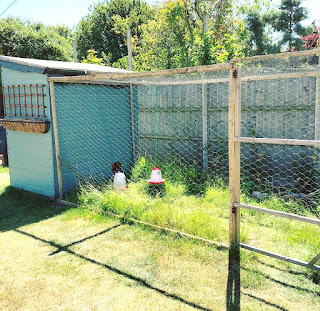 our offer was accepted but we were then told by Jon's brother in law who is Norfolk born and bred that the area the house was in was a no go area. So we've pulled out and are off back up to Norfolk on Tuesday to view a different house! Lets All Go To Okido!! For the last 8 years of my life I have been watching Cbeebies. They boys all adore it and when new shows come on they all get extremely excited. is Messy Goes To Okido! 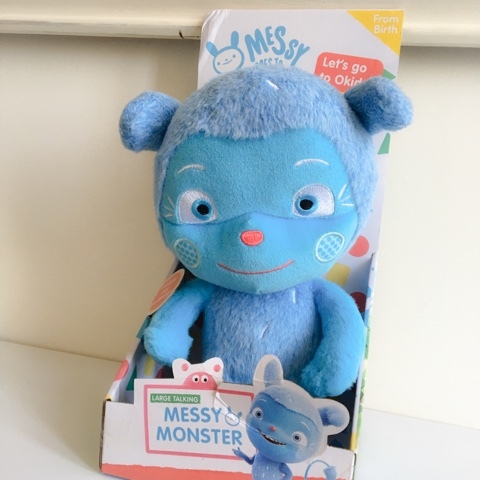 So when I was asked if I wanted to review the brand new talking Messy teddy from Golden Bear Toys new range I was more than happy to say yes. Messy magically transports us from the real world to the land of Okido, where he finds the answers to his questions. Why do things fall down and not up? Where do echoes comes from? Why does my stomach rumble? The aim of the series is to visually bring science to life using stories, comedy and adventure. Messy’s questions cover all aspects of science, from nature and biology to technology, from atoms to outer space, and everything in between. Rupert loved his Messy Monster from the moment he unboxed it. Messy has already gone on many adventures with Ru, he's been to Mimi's, to nursery, to the park and even the doctors. Messy is never far from Rupert's side. The bear is incredibly soft and super cute! With Christmas just around the corner, Messy would make a perfect present for Messy fans. 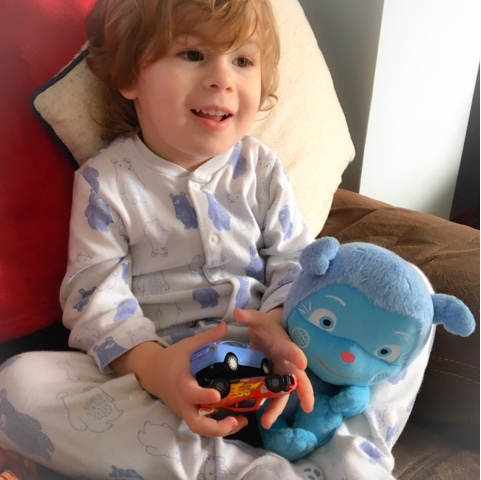 This cuddly soft toy measures 24cm and features Messy’s favourite phrase: “Balabalaboomboom” along with many more fun sounds from the TV show! 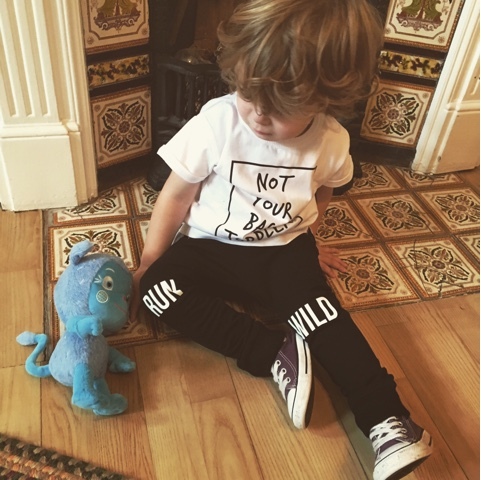 The Large Talking Messy Monster is made from a mixture of soft and furry fabrics and features cute embroidered facial features. I made this over the weekend and it went down a treat. The boys all loved it and are desperate for me to make it again. 2 tablespoons of runny honey. Mash the bananas in a bowl and add the apple juice and leave to the side. cream up the butter and then add one egg at a time, making sure it is completely mixed. Then fold in the flour, cinnamon and honey. Put into a bread tin and place in the oven for 40 minutes or until golden brown. You can find the full method over on the Jamie Oliver website. The twins were sent a rather large parcel last week. Their eyes lit up with excitement as soon as I told them it was for them! The boys love watching kid tube so when I asked if they would film an unboxing for me they were more than happy to do so. I'm not sure they'll be the next big YouTube stars but for 4yr olds they did pretty well! and a workbench which included a hammer, a spanner, a screwdriver, a saw, nuts and bolts, a clamp, a tape measure. The work bench was nice an easy to assemble, the twins were ready with the chain saw and jig saws to lend a hand, but when I said they weren't needed they went off to "fix" the box the goodies came in. 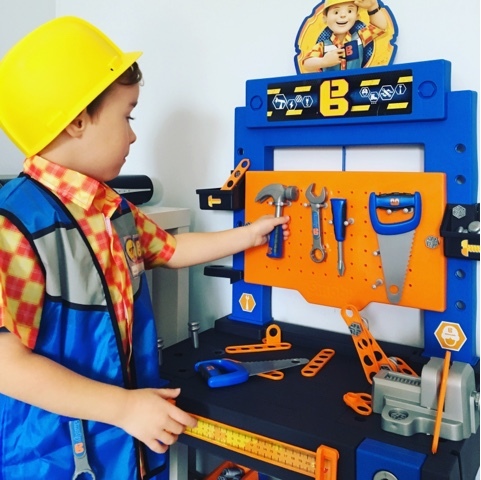 Oscar was the first one to dress up and get to the work bench to try it out! 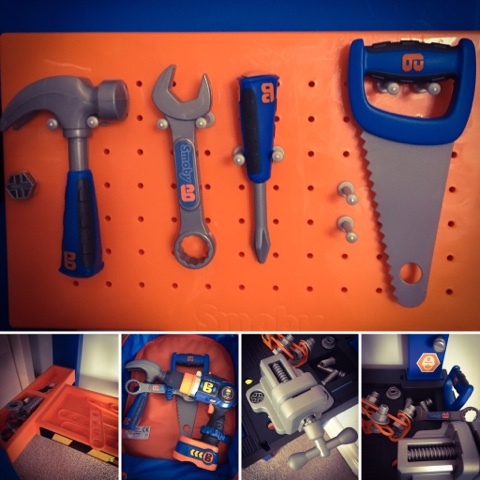 He loved all the different tools and that he could actually hammer, screw and build with the bench. Alex soon joined in once he had "fix" everything with the chainsaw. 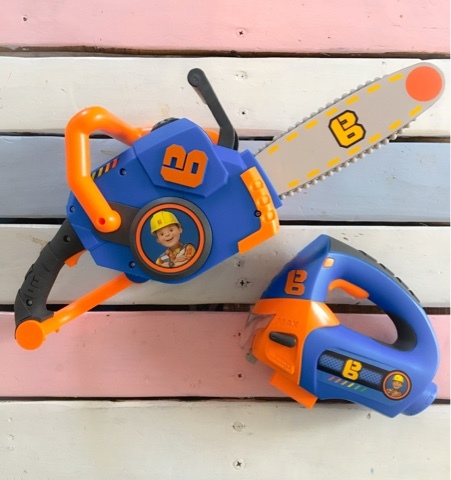 The Chainsaw and Jig-Saw make real noises and the Jig-Saw lights up when used. These were big hits with the boys but after a while my ears decided they needed a holiday! The boys and their two friends Elsa and Tate enjoyed playing builders all day, they all enjoyed the work bench and running around the house trying to fix everything they could. As soon as Ru walked in from nursery he was all over it like a rash! 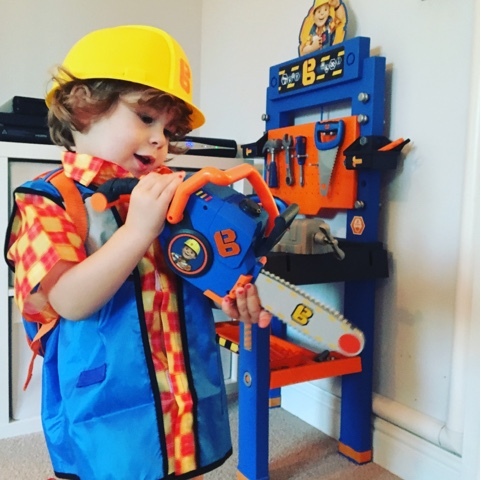 He does make a cute little builder. 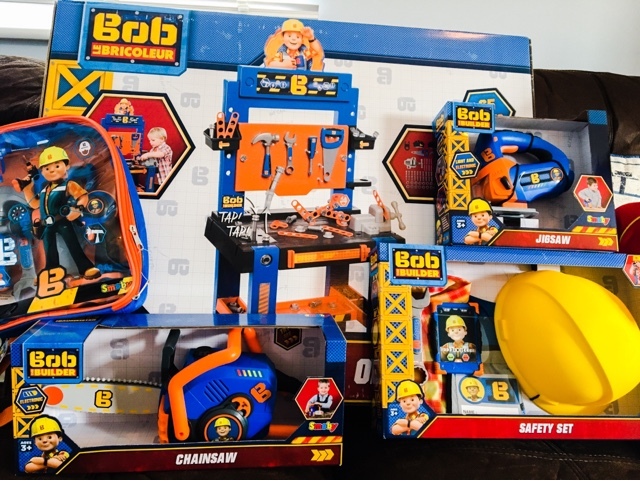 Any one of the Bob The Builder toys would make an awesome Christmas or birthday present. The prices of the toys above range from £12.99 up to £44.99. 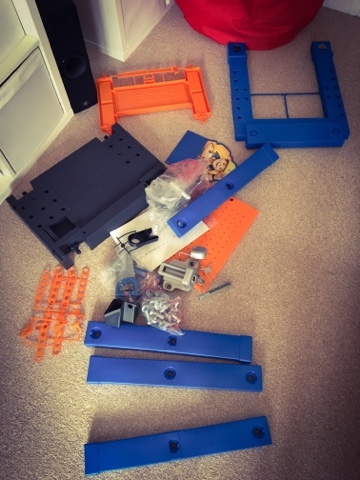 All the toys are well made, and if they can with stand the twin test they will please most children! 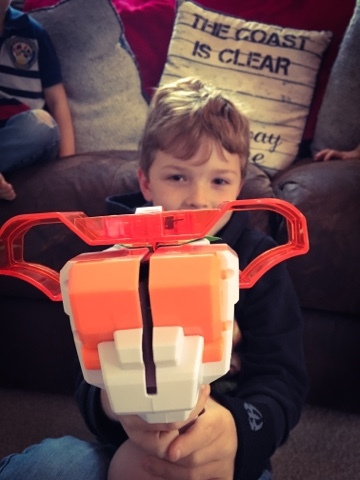 **I was sent the toys for free, in return for an honest review. All thoughts are my own. Over the weekend I noticed Ru had a really nasty cough. Which was worse in the evening and morning. I decided to call the doctors first thing on Monday to get him check out. I was thinking beginnings of a chest infection or something viral. I got to our doctors with not a lot of hope as usually they are so rubbish. 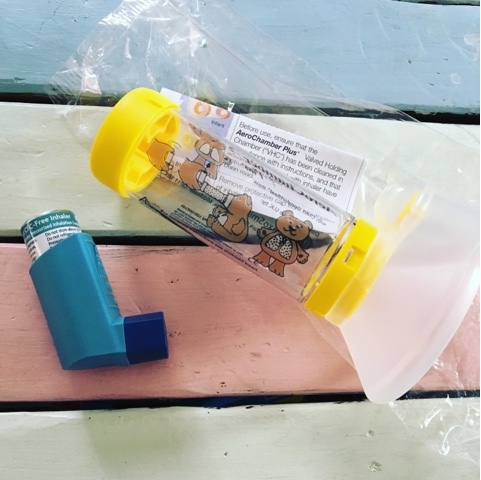 I explained what was up and the doctor had a good listen of his chest and looked in his ears and mouth and she said it wasn't a chest infection and she though it sounded a bit like asthma. So she prescribed him a blue pump and spacer. I'm completely in the dark when it comes to asthma but Jon has it and wasn't too surprised when I came back with it. He's to take it every time he has a coughing fit. He isn't too keen on it and I can manage about one pump before he pulls the mask away. He hasn't fully been diagnosed with asthma and the doctor didn't say much after she told me how to use the pump. So I'm still slightly confused as to whether this is something that's going to be long term. Has anyone else's toddler been given a pump? In The Kitchen With Ru-Bear || Cake Pops! Pampers Club - Where Every Poo Is Rewarded!